The idea of building my own home (well, hiring someone to build it) is wild to me. That's some phenomenal cosmic power. You can include all your favorite things and leave out the details you hate. The only thing that would make building a new home even cooler? If you were putting in a pool with it. Talk about living the dream. So if you're building a new house, when should the pool be installed? The answer is... "It depends." The ideal time: after power, before asphalt and landscaping. Of course, things aren't always so simple. When should I install a pool in my new home? When your home is under construction, you should install your pool after the power is on but before the asphalt and landscaping are finished. Lock the pool in place with concrete, and cover it with plywood if there's more construction. We don't want to leave the pool uncovered and not running for an extended amount of time. Let's say the house is under construction. The house goes up, they get the exterior of the house pretty much done, and they move inside. It's usually months before they get electricity to the house. That's the pivot point: when they get electricity to the house. Once there's power, you can move forward with the pool. We also want to avoid messing up fresh asphalt and landscaping. After all, no one wants giant machinery tearing up the flower beds or cracking the new driveway. Your brand new house deserves to look new! We want to try to get the pool in after there's power to the house but before access gets cut off and before the backyard (irrigation and landscaping) is finished. If you have to go in earlier than that ideal time period, make sure you cover the pool up. There have been times where we had to put a pool in and it sat for months. Almost every time, we suggest covering the pool with a plywood floor, especially if it's close to the house. During construction, anything that happens in the backyard ends up in the pool. Nails, screws, razor blades, buckets, shingles, cardboard, paper...you name it. We've literally removed buckets of stuff from pools before. It takes forever to get clean. Worse, if you've got a bunch of nails in there and they rust, it's gonna stain the floor. Get some concrete around the outside of the pool. If the pool's going to sit for longer than just a few weeks, you need a concrete apron of some kind around that pool to keep it from moving. Say it's a rectangular pool. If there's a lot of traffic too close alongside the pool (tractors and whatnot), it could push the walls in. Concrete will keep the pool in position so that it's exactly the same way as you left it. Also, ensure all surface water is diverted away from the pool. What if I have to finish the house first? Sometimes if you're financing the home, you have to finish on the house and close on the loan before you can start on the pool. If you're forced to wait until the house is closed on, talk to the builder. Ask them if they're able to work with you. A lot of times they can. The builder may be able to hold off on little things like irrigation and landscaping and putting the final seal coat on the asphalt driveway, so they can come back and do it later. Will the builder charge more if you add a pool to the house project? The home builder will only charge more for a pool if they're also the general contractor for the pool. In this case, they will treat it like any other subcontractor and put their markup on it. If you've only contracted for the house and later you decide to add a pool as part of the construction, the home builder will charge extra for changing plans and for the time/effort of adding a pool. If you're contracted directly with the pool company, the home builder shouldn't charge you any extra unless there's some work it's causing them to do. Want to learn more about inground pools? 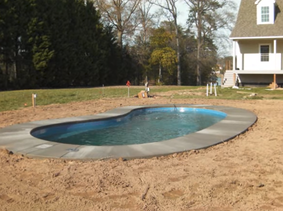 At River Pools we manufacture and install fiberglass pools in Virginia and southern Maryland. Lest anyone feel left out, our pools are also available in other states through our nationwide dealers.